The Turkey Vultures are back! 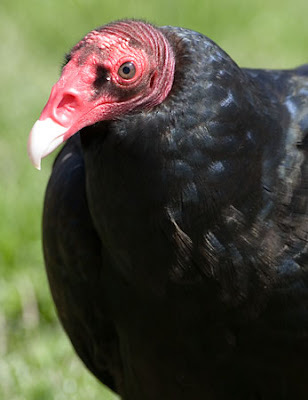 Shady and I were taking a dewy, early morning stroll by the big pine trees in the side yard and we startled about 15 turkey vultures in the treetops. The din was amazing--and then silence as they sailed around in big wide circles with their meaty heads bearly identifiable. I found out that the vultures have these clean, red heads so they can dig further into carcasses when feeding. Urg. They do come home every spring and sometimes the fall. Maybe baby vultures?